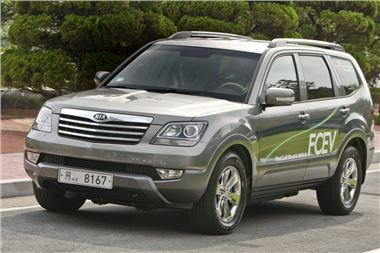 Towards the end of 2010, Kia was one of seven manufacturers to sign an agreement to make hydrogen fuel-cell (FCEV) vehicles commercially available by the middle of this decade. The car that is regarded as a panacea for a zero-emissions future - one that can make its own electricity on the move, cover long distances between refuelling and emit no CO2 - is coming. Hydrogen cars are just one strand in Kia's alternative-fuel strategy, however. Hybrids are already in production for some markets, and will soon appear in others. Additional hybrids are currently under development. Battery-electric vehicles are on the way, too. Alternative-fuel vehicles are nothing new to Kia. Work on them has been going on for more than 20 years. Kia produced its first electric vehicle (EV) - based on the Besta van - as long ago as 1986, and an electric version of the Sportage in 1999. Electric vehicles are best suited to short journeys mainly in towns, where their limited range is not an issue and their charging infrastructure is most likely to be found. The three-seater Pop concept from the 2010 Paris Motor Show gives clues to the company's thinking. Hybrids, which have a small electric motor for limited low-speed urban journeys and a fossil-fuel engine for highway driving, are an interim solution on the way to the long-distance zero-emissions car, and here, too, Kia is well advanced. As long ago as 2005 the company put a pilot fleet of Rio hybrids on trial to test the technology. 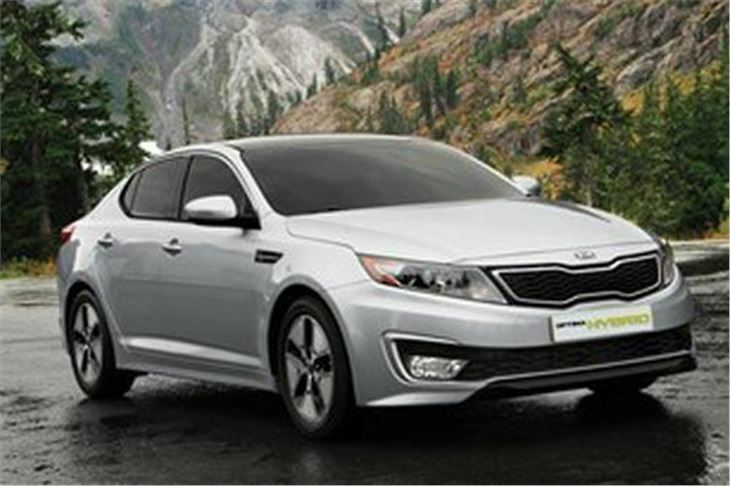 At the 2010 Los Angeles International Auto Show, Kia revealed a petrol-electric hybrid version of the new Optima saloon, which is now on sale in both the USA and Korea. It has a 2.4-litre petrol engine and a 30kW electric motor driving through a hybrid-specific six-speed automatic gearbox. Uniquely among current hybrids, it has a lithium-ion polymer battery which is 30% lighter than the nickel-metal hydride systems in rivals, but has a higher energy density. It can accelerate to more than 60mph on battery power alone. 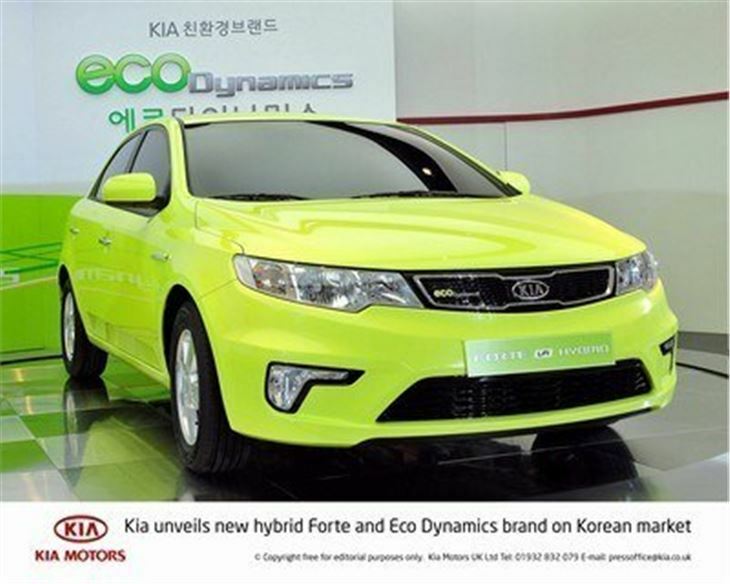 In Korea, an unusual hybrid system running on a mixture of liquid petroleum gas (LPG) and battery power has been available for in the Forte saloon, a car similar to the European cee'd hatchback (the green car in the photos). It is powered by a conventional 1.6-litre engine converted to run on LPG and a 15kW electric motor, and though it is unable to run on electric power alone, this combination is sufficient to bring CO2 emissions down to 94g/km. In May 2011 Kia announced plans to offer an LPG hybrid version of the new Picanto, too. However, Kia is putting its faith in hydrogen fuel-cell vehicles as the answer to long-distance mobility with zero tailpipe emissions. Fuel cells work by combining hydrogen and oxygen in a complex metal box knows as a fuel stack. A chemical reaction creates electricity, with pure water as the only waste by-product. The trouble is, fuel stacks are extremely expensive and in most countries there is currently no hydrogen refueling infrastructure. Both problems are now being solved, however. Fuel stacks are now becoming cheaper as development makes them smaller and less dependent on precious metals, and enlightened countries like Korea are starting to establish a hydrogen fuel station network. Kia developed its first FCEV in 2003, based on the Sportage, and has now advanced the technology close to the production-ready stage in the Borrego, a large SUV. It can cover more than 500 miles on a tank of hydrogen, and manages the equivalent of 54mpg. Kia has not yet decided which model in its range will be the first to go on sale with a fuel cell, but it has committed to start building limited numbers of FCEVs and aims to have them commercially available by 2015.